Had a few instances of installing specific business software or older programs that get a prompt in Windows 10 that .Net 3.5 will be required. They'll either try and add it and fail or you'll attempt to manually install it from the Windows Features section of Control Panel > Programs. Often you get error 0x800F081F saying that the source files could not be found. We've regularly seen this in a Windows Small Business Server environment, eg SBS 2008 or SBS 2011. The key fact here is that there's an on-site WSUS server providing local Update Services. Unfortunately it doesn't have the download available for .NET 3.5 for Windows 10 Pro. There are several recommended fixes involving using a Windows 10 USB installer or downloading the Windows 10 ISO - not always practical on a remote support session - and they don't always seem to work. The best fix and the simplest option we've found to be effective is s asmall registry change, which tells Windows to contact Microsoft directly for Features and Repairs, and not use WSUS. which should let you Edit Group Policy, see image above. You might need to start a CMD prompt (use Window-R again) and type 'gpupdate /force' to get the new setting to be applied immediately. Attaching a new Buffalo Drivestation 3TB Velocity USB 3.0 backup drive (HD_LXU3) to an old Windows Server 2008, which is part of Small Business Server 2008, reminded us of an error we'd not seen for a few years. The standard Windows Server backup failed to run within a couple of minutes, despite having been configured for the new drive. The Event Log showed an Exchange error from source msexchangeis with event id 9782. This was a little misleading, because all the exchange esetuil diagnostics and repairs will show no fault. A little further on in the event viewer you might also see an error that the backup failed with following error code '2155348010' and event id 517, which is a little more useful. The fault lies with the fact that the Server 2008 Backup doesn't support larger capacity drives with the newer Advanced Format using 4096 byte sectors. It will only backup to a drive formatted with 512 byte sectors. Note that this is referring to the drive format sector size, not the volume or partition sector size. We've had a few license warnings for Avast Business Antivirus Cloudcare recently. Usually when upgrading, eg from Cloudcare 4.2.x to 4.3.0. To fix the licence warning you usually need to uninstall the current version, reboot and reinstall the latest. 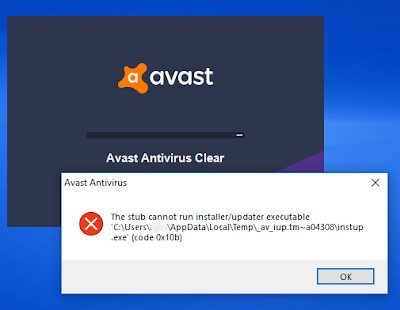 Even then it doesn't always work and using avastclear, the official uninstaller program from Avast / AVG is the way to go. Note that this should be run from Safe Mode. When you run avastclear you might see the error shown in the diagram here. Took a while to work this out - you need to be logged into Safe Mode as the local administrator, not a domain admin account. Then the uninstall will run and reboot. A quick update to a popular post from a couple of years ago. We talked about recovering the Apple parental control restrictions PIN from an iPad backup file. Just had to repeat the exercise on another iPad. There's a newer, more useful article at igeeksblog that links to a Windows program called pinfinder. There are plenty of management tools that will gather the data for you, but if you're on a domain network and just need a quick way to gather some serial numbers for known computer names, try this method using the command prompt shell. WMIC BIOS GET SERIALNUMBER to retrieve the Dell serial number, aka Tag Number. Often that command is blocked by firewall and security settings if you try to run it remotely using the /Node option. Similarly for PowerShell commands using the Get-WmiObject command. I also couldn't find any useful info in the registry either via regedit, so no quick shortcut with Remote Registry service. By far the quickest and simplest way was to take advantage of the Sysinternals PSExec command. This allows you to run a remote command shell from a local computer. In ACT, look under Tools > Preferences > General. Then under Locations change to Spelling Dictionary, to see the folder where the dictionary was expected to be located. Its likely to be something like C:\Users\\AppData\Roaming\Act\Act Data\Spell. Now go and check that directory and you'll probably find a CUSTOM1.DIC file, but no MAIN.DCT file.